Vinyl flooring has a lot of great features, regardless of the type of vinyl that you are looking to purchase; however, luxury vinyl and sheet vinyl have some differences that may affect which one will work the best for your needs. 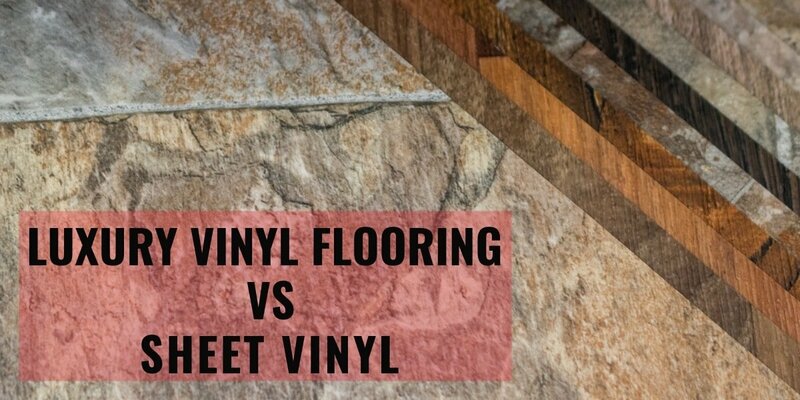 While there is a huge selection of vinyl that is available across the whole price spectrum, in general, sheet vinyl tends to run cheaper. Sheet vinyl costs on average between $1 and $2 per square foot, while luxury vinyl runs between $2 and $7 per square foot. Installation cost also tends to be less for sheet vinyl than luxury vinyl. Luxury vinyl is a more durable material than sheet vinyl. Sheet vinyl has two factors that work against it. First, it is prone to curling. Because it is made on large rolls, the edges of the sheet vinyl can curl back up, much like paper would if rolled tightly. This is even more prominent if there are any seams. Second, it does not hold up as well to wear and tear, and if there is damage to the vinyl, there is no way to repair it without replacing the whole floor. With luxury vinyl, you have the option of just replacing the planks or tiles that are damaged. The main area that sheet vinyl does work better than luxury vinyl is in water resistance. While many luxury vinyls are waterproof, they have seams between the planks/tiles that allow for water to seep through to the subfloor. This can cause damage to the subfloor and cause issues even if the vinyl is fine. If you’re looking at a luxury vinyl that is not waterproof, but rather water resistant, then you also may have issues with water seeping into the core and causing damage. Sheet vinyl has the benefit of not having any or very few seams. Because it is a single sheet, there is no way for water to seep in and cause damage to either the flooring or subfloor. Both luxury vinyl and sheet vinyl come in a wide range of styles, including those that mimic stone or wood. Luxury vinyl does a much better job of mimicking, however, since it has the grooves between the planks/tiles, and more realistic textures. Sheet vinyl and luxury vinyl are both great flooring options if you are looking for a beautiful, low maintenance flooring that will last for years. Stop by Carpet Depot and let us help you choose the best flooring to fit your home, needs, and budget.